Melissa Grasso is Head of Culture Development at NAB and has attended my training workshops a couple of times. Recently she had to present to her colleagues the plan to embed the company’s values and behaviours into all their systems and processes. She started with the following story. When I was 16, I was visiting my grandparents on the Gold Coast during the summer holidays. My sister and I often visited them over the summer, and usually we swam in their pool. But on this day I was out swimming in the surf. I was a very strong swimmer, having been swimming competitively for a number of years. But I wasn’t familiar with swimming in the surf …and I certainly didn’t know what a rip was. I did know that I was supposed to swim between the flags, but I didn’t know that the flags were usually set up to keep people out of a rip. So, I didn’t really keep my eye on the flags. And after a short while, I drifted outside the flags without knowing. Suddenly I was caught in a rip. I could feel straight away that I couldn’t swim against the flow of the water and I was moving further and further away from the shore. But I didn’t know you weren’t supposed to swim straight for shore going directly against the flow of the rip. I had never been so frightened in my life. So I swam hard and fast diagonally toward the shore. Eventually I made it back to shore utterly exhausted and relieved. I was so grateful that I was such as strong swimmer and that I noticed the pull of the rip quickly. Later I found out how many people drown in rips because they don’t know to swim between the flags or how to get out of a rip. It was pure chance that I did this and I realised even more how truly lucky I was. because of the importance of keeping our eyes on the flags so we don’t get caught in a rip. It reminds me of how important it is as an organisation to stay focussed on our vision. To avoid drifting away from who we want to be. 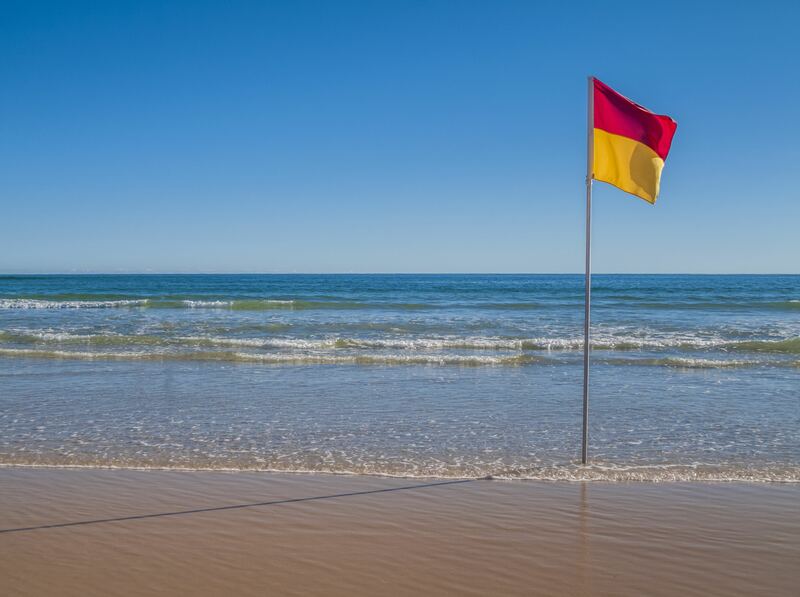 For me, our organisation’s purpose, vision, values and behaviours are like setting the flags in the sand. If we forget to keep our eyes on the flags, then we can easily drift away (without even noticing) from the core behaviours that we need to sustain to deliver exceptional service for our customers. Through the rest of the presentation Melissa kept referring back to the flags as a metaphor. The feedback she received on the day was really positive about the story because it helped people connect with and understand her message. What’s more, she has had colleagues tell her that they keep thinking about the flags as a metaphor for NAB’s values and behaviours. This is another example of how you can use a personal story to get your message across in a more engaging and memorable way. If you would like to develop your own stories to use in business, register for one of my public workshops in 2019.